The Treatment and Prevention (TAP) study is the first of its kind in the world. Using a nurse-led model of care, people infected with hepatitis C will have the chance to be treated with new highly effective drugs. These medications have minimal side effects, hence the possibility to treat people without them having to attend hospital health services. The TAP study will assess if treating people who inject drugs in Melbourne for their hepatitis C reduces transmission in the community and the prevalence of infection. Study participants will be drawn from a cohort of over 700 people who inject drugs (PWID), who have been participating in research with Burnet Institute for many years. PWID are at particular risk of hepatitis C infection and many have difficulty attending large hospitals or health services, hence the idea of providing community-based treatment. 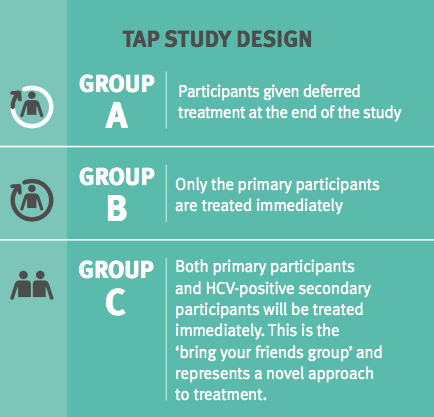 The TAP study explores the concept of ‘treatment and prevention’ (also known as ‘treatment as prevention’); treatment not only results in cure for the individual, but also prevents the spread of hepatitis C virus (HCV) to others. 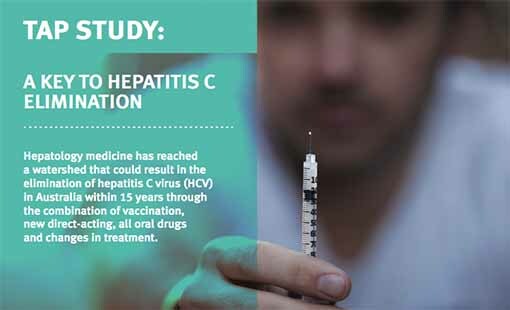 The study will assess if treating PWID in Melbourne for their hepatitis C reduces transmission in the community and the prevalence of infection. Professor Alex Thompson, Director of Gastroenterology at St Vincent’s Hospital, and St Vincent’s Hospital, are co-investigators in this project. The TAP study will involve more than 400 participants who will be followed up for two years. One hundred and thirty people will have treatment in early 2015; others will be treated at the completion of the study.